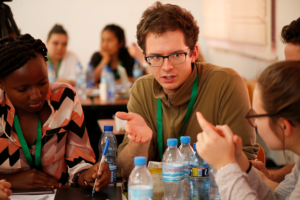 (Bagamoyo) Young scholars from Tanzania and Switzerland gathered at the Ifakara Health Institute (IHI) Kingani Training Center from January 8 – 18 2019 for the ten-day Winter Academy. According to the Head of Training and Capacity Building department, Dr. Kafuruki Shubis, IHI hosted the event in collaboration with the Swiss Tropical and Public Health Institute (Swiss TPH) with funding from the Swiss Study Foundation. A total of 26 young scholars from different academic background were guided through a process of thinking and understanding effective planning and resource allocation for public health. 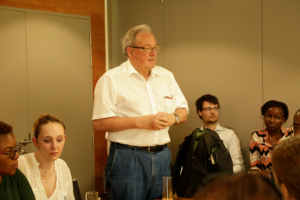 Prof Tanner speaks during a visit of the students to the Swiss Embassy in Dar es Salaam. The group included lawyers, psychologists, economists and those specializing in public health, and topics covered are: heath and wellbeing and determinants of health systems; health systems and health insurance in the digital age; decentralizing and appraising a health system. Winter Academy students and facilitators in a group photo.